Seems a little silly in the wake of Sandy's mass destruction, but if y'all are looking for a distraction (such as making fun of an author's speaking voice), pop on over to the Functional Nerds podcast, where I sat down with John and Patrick for a chat last week. This was my second time hanging with said Functional Nerds, and as ever, it was a delight. I'll happily crash their party anytime. Thanks for having me, gents. Whew! I just got back from a fantastic time at QuebeCrime, where I was fortunate enough to hang out in a beautiful city with some tremendous writers and some passionate, thoughtful genre fans (and also eat poutine.) And while I was gone, a new review and interview hit the interwebs. "With the second Collector novel, Holm both expands and enriches the world he so vividly created in DEAD HARVEST... highly recommended." And the interview was conducted by Scott Montgomery of BookPeople. Scott's one of the nicest guys you'll ever meet, and damn knowledgeable about the crime genre to boot, so I'd never miss a chance to sit down and chat with him. You can read the results here. I confess, when it comes to my Criminal Minds post, my head wasn't entirely in the game. See, tomorrow, I leave for QuebeCrime: three days (Oct. 25-27) of hanging out in a beautiful city with some of the coolest writers in the crime community - not to mention play amateur CSI with some enthusiastic fans! (No, really: the schedule of events is awesome.) I'll be reading and signing Friday evening, and talking reading and writing on a panel that features John Connolly, Chelsea Cain, and Owen Laukkanen on Saturday morning. Mark Billingham, Linwood Barclay, John McFetridge, and Laura Lippman will also be in attendance, so, you know, beat that! If you're in the area, I'd love to see you there. "Chris has taken the Rule of Successful Sequels (do what you did last time but do it better) and applied it so thoroughly I’m surprised he didn’t just call the book CHRIS F. HOLM PUNCHES ALL OTHER NOIR WRITERS IN THE NUTS. AGAIN." Today's review of THE WRONG GOODBYE comes courtesy of Morgan Crooks at Ancient Logic. Morgan and I go back a ways, so he may well be biased, though lord knows in which direction. Click through to find out what he had to say! "THE WRONG GOODBYE is an unrestrained joyride that will leave you breathless by the time you are done." "Holm did it again. THE WRONG GOODBYE is an amazing follow up to DEAD HARVEST, but stands surprisingly well on its own." "This action packed novel will keep you reading late into the night and provide hours of entertainment. An irresistible treat for all the urban fantasy fans out there." "...very good, page-turning fiction. One might think she knows where all of this is heading, but one might be wrong. Or not. Either way, very enjoyable." "...THE WRONG GOODBYE is tight, well-paced, and did a great job of building on the events of the first book..."
Today, I'm over at My Bookish Ways, laying out my top five Halloween traditions. Go check it out! The lovely folks at SF Signal were delusional kind enough to ask me to participate in their Mind Meld feature on heroes today. My take on the relevance (or lack thereof) of heroes in modern fiction appears alongside those of such asskicking authors as Matt Forbeck, Jo Anderton, and Maurice Broaddus, which should feed the slavering beast that is my ego nicely. You can read the results of my dubious ruminations here. Thanks to the whole SF Signal crew for having me by! Today, at Criminal Minds, I'm talking about character names. Pop by and check it out! "...in THE WRONG GOODBYE, Chris F. Holm really brings the awesome... The action is pretty much nonstop, yet somehow the author managed to balance that with laugh out loud and terrifying moments in equal measure... If the author keeps this up, he’ll be giving some of the big UF names a run for their money, very, very soon. If you haven’t discovered this series yet, you’re in for a wonderful ride!" What can I say? It was a blast. A joy. A wild book- and booze-soaked pinball game in which I bounced off countless smart and talented folks (only occasionally literally), only to find myself back home later exhausted, delighted, and a tad melancholy at the thought I won't see most of them again for quite some time. This is the part where most folks would throw out a list of names, but I'm not gonna take the liner-notes approach today. For one, they're all so much cooler than I, it'd no doubt look like name-dropping. For two, I'd doubtless forget someone, and feel like a heel. And for three, even if I blanked on half the awesome people I encountered in my B'con travels, that list would make for the longest post I've ever written, and prove boring as sin for anyone who wasn't there to read. So instead, let me say this. Thanks to friends both old and new. Thanks to everyone who attended my panel (or my lovely wife's), and double-thanks if you asked questions, or took the time to comment afterward. Thanks also to my fans, which I'm shocked and delighted to discover I have. And to the many, many folks who were kind enough to pick up copies of my novels in the book room (I hear tell they sold out! ), happy reading; I hope you like them. Finally, to those who've never had the pleasure of attending a crime-fic con but are considering it, let me say this: BY GOD GO. The mystery community is, quite simply, the finest group of people I've ever had the pleasure of knowing. They are my tribe. My family. And if you think you might be one of us, guess what? You already are. THE WRONG GOODBYE now available in the UK! Today, as I wake bleary-eyed and groggy at this ungodly hour to put myself on a plane bound for B'con, is the official UK release date for THE WRONG GOODBYE! I hope y'all enjoy it. I had a blast writing it. Shotgun Honey Presents: BOTH BARRELS now available! Man, oh, man. Just look at that list of contributors. Ron, Kent, Sabrina, and Chad really outdid themselves putting this collection together. These folks are so damned talented, any one of 'em would make an anthology worth picking up. In fact, I'm not sure how I managed to sneak a story into this one. The fact I'm lucky enough to count many of them as friends is just the icing on the cake. And you know what the delicious crunchy sugar-flower atop the icing on the cake is? 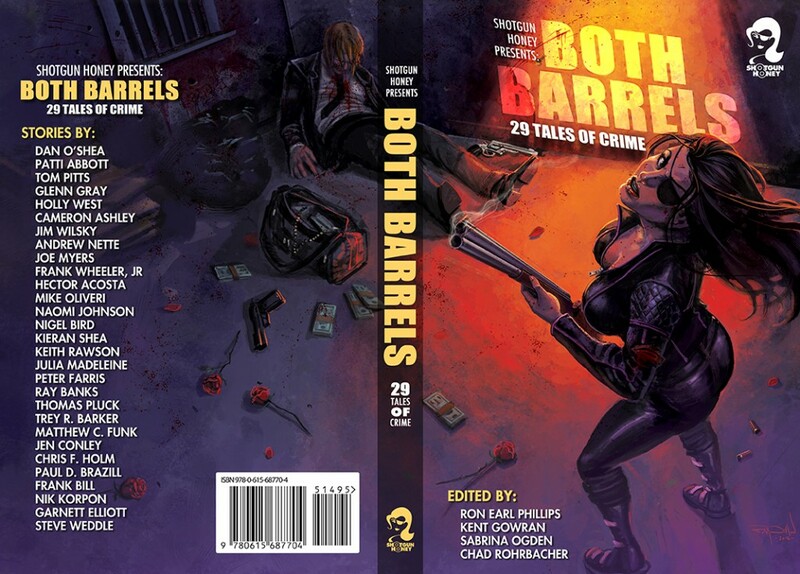 BOTH BARRELS is now officially available. I'm talking print, ebook, the whole shebang. The only question is, what're you still doing here? Click through, and pick yourself up a copy today.